Do you use any extension? Did you try cleaning cookies and cache? What version of Opera and OS? Turbo or VPN enabled by chance? Do you have any third part software that may be interfering on your Internet traffic like anti-virus and so on? I'm getting the exact same issue as of today (May 25th). I've ran 2 different virus scanners (also in safe mode) I've checked proxy,vpn, and extensions. Nothing has changed today except - I very rarely use skype. Today I did and it acted really strange when I started it up. After that is when the issue began with the search issues. Though I don't think that's the cause - as chrome and IE browsers are working as intended. The problem isn't consistent either - sometimes it will go through the normal google searches, sometimes it won't. Refreshing the page when it acts weird fixes the problem after 1-3 refreshes. If the network is not too fast switches itselft to the old version. Any on the go coffee network? Hi guys, yeah I also have this problem, is there a fix??? I am not going to start another thread because I also experience these problems. My brother and I on separate computers both have encountered the same problem. It started today with Google sending old format pages sometimes and I updated it (there was a new patch available) and now the problem is even more extreme with normally formatted Google pages not even appearing. This is also the case with the Google.ca homepage as operauser12356 stated. I cleared my history and caches on google and even removed every single extension I had installed (even if they were not enabled). I have a fast internet connection I strongly doubt the connectivity has anything to do with it. My brother is also on ethernet and even faster internet but still the same problem. I have no VPNs enabled (I never even really used them). Internet Explorer works fine with Google (I am on Windows 7). My brother is on Windows 10 and his Edge works fine as well. It appears to just be Opera. My version of Opera is 45.0.2552.812 (PGO) and although I can't confirm I think my brothers may also be the same one. I also do not have any proxies on as far as I am aware. It also does not matter if Opera Turbo is on or not. This problem still occurs. I ran a malwarebytes scan and it did not pick up anything relating to Opera. I still have to run HitmanPro and verify Malwarebytes did not miss anything though. I disabled both Malwarebytes and Kasperky (my main anti-virus) and the problem still persists. I'd like to hope it isn't malware but right now I have no proof it is or isn't. I believe it could be something with Opera (the ammount of people getting this issue are making me suspicious) but that is all I have to go off of. I have yet to do a clean and full uninstall and reinstall to see if it continues there and I am going to try an earlier version of Opera but am unable to do so right now. and user agent is "Mozilla/5.0 (Windows NT 10.0; Win64; x64) AppleWebKit/537.36 (KHTML, like Gecko) Chrome/58.0.3029.110 Safari/537.36 OPR/45.0.2552.881"
Getting this problem as well. Using an extension to change user-agent is working. 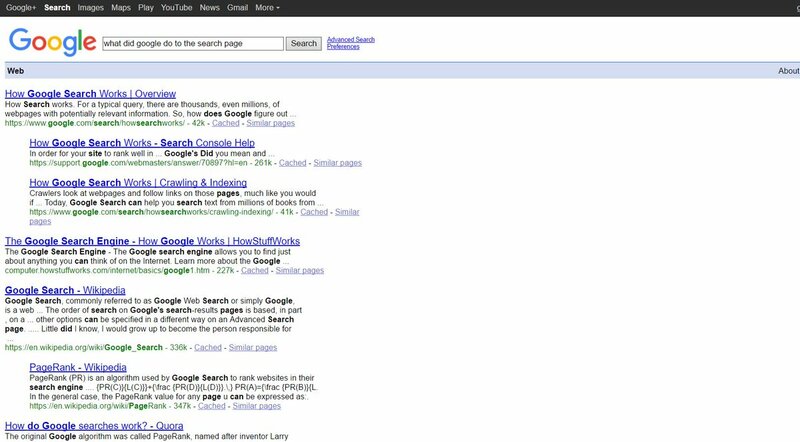 Using the Google Chrome agent displays Google normally without the old ui. Apparently this is an issue on Googles end. It's not my connection, and I'm on Win 10. Same problem here. Do we have a bug report? I've never opened one for Opera before, but I could look into it. Having the same problem as Operauser12356 here. It started randomly yesterday(May 25th), refreshes would sometimes fix it, now it's just stuck to the old version. I have latest Opera installed and use 2 extensions: adblock and Gmail notifier. Running on windows 7 64 bit with latest security updates. Tried clearing cookies, didn't work. Also tested on IE and Chrome, no problem with those 2 browsers.